When the Italians invaded Egypt in September 1940 it was defended by the British Western Desert Force, a relatively small and under-equipped force with responsibilities for the whole area. One year later, with the local conflict now involving growing numbers of German troops, the expanded force became the Eighth Army, which would prosecute the war in North Africa until it was cleared of enemy troops. It then formed part of the forces clearing the Axis from Sicily and Italy, and ended the war occupying Austria. During that time it became familiar to everyone on the Home Front, and created a name for itself that has long outlived the war itself. The Eighth Army was made up principally of troops from Britain and many parts of the Empire, plus contingents from France, Poland and Greece, but for the most part clothing and weaponry was supplied by the British to keep logistics simple, so this multinational army had a relatively consistent appearance. The uniform was Khaki Drill, usually shirt and shorts, plus long socks under short gaiters and boots, although in wet and cold weather many other items were also worn. The nationalities largely kept their own headgear, but when in action all wore the standard British helmet, so the figures in this set could be for any of them. The uniform is correctly modelled here, as is the webbing, which is the usual ’37 pattern in all cases. A couple of the men wear the field service cap rather than the helmet, which is a surprise, and the officer wears his peaked cap, which again would normally have been replaced by a helmet when in combat. Naturally the focus of this set is the selection of weapons on offer, and we start with one of the poorer ones. Our first pictured figure is firing a Boys .55 inch anti-tank rifle, which was used by the Eighth Army but was not well liked. To start with it had a vicious recoil, so was not often fired while resting against the shoulder like this, but more to the point it had quickly been rendered obsolescent by the newer German tanks when they appeared in Africa. Against older tanks and the Italian tankettes it had been effective, but as the Desert War progressed it could not stop the better armoured tanks. However it was still used for want of anything better until the introduction of the PIAT in 1943, but would mostly be seen early in the campaign. This one is a type 1, because it has a monopod support, although this should be T-shaped. Next on row one is a soldier with a Bren gun. The Bren was a popular weapon, it coped with the difficult desert environment well and rarely let its handler down, and the same is true of the last weapon on this row, the Vickers medium machine gun. In use since World War I but still a good weapon, it has been modelled many times already but this is a good one too. Most obviously missing is the condenser can, particularly important in the parched desert landscape, and the tripod has been skewed a good deal to allow the whole thing to be moulded as a single piece. Also missing is any sort of sight, and for those with an interest in such things this weapon has the fluted barrel cover of the earlier models rather than the latest production. We will begin row two with the prone man, for he is ready to fire a PIAT ('Projector, Infantry, Anti Tank'), the weapon that replaced the anti-tank rifles. This was an effective weapon, and relatively simple, yet it could handle any tank of the day if used properly. Unfortunately it only appeared in 1943, and made its debut in the campaign for Sicily, so was not seen during the Desert War. However this set is not limited to North Africa, and considering the weapon is a simple one-piece affair it has been fairly well done here, although is rather shorter than it should be. The rest of the second row is devoted to the mortar, which is the standard British 3-inch model widely used on all fronts. The model here has a barrel a little longer than the real thing, but not too obvious, although the designer has failed to understand the working of the bipod and has made the central rod into a third leg, as has the artist for the box. Luckily a sharp knife will quickly fix this error. The man feeding a bomb into it is fine, but we wondered at the kneeling figure wearing the cap. By his position it seems Strelets mean him to be associated with the mortar, but he holds a strange hour glass item which we could not identify. Certainly it is not any form of ammunition for the mortar, and looks almost like the bulbous bombs used briefly on some 2-inch mortars in the Great War. This time the box illustration has it right, but we do not know what the sculptor was trying to do (although it has been suggested that this is a really bad model of a PIAT round). The mortar itself comes in the two pieces shown, which make a fairly decent model that is certainly less fiddly than those that come with a separate base plate. 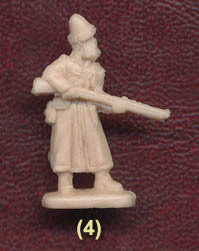 The third row begins with a man using a range-finder - useful for lots of weapons - followed by the officer figure. This man has arm raised and is looking at his watch, so perhaps is about to order open fire at a set time. It’s a very relevant pose for the set, and a good choice in our view. The last two figures are of a gunner and observer for another Bren gun, this time on a common mounting for use as an anti-aircraft weapon. We particularly liked this pairing, with the observer holding a fresh clip for the gun, and standing over a box with more inside. Things have got a bit confused at the muzzle of the weapon, which does not line up with the rest of the barrel, and the gun itself is not far enough forward on the mounting, with the bipod showing in front, but otherwise this is a nice piece. So much for the heavy weapons - what about the light ones. Well no one here is carrying a rifle, although some may have one close at hand. Two of the men have what look to be Thompson submachine guns slung over their backs, one of which has the round drum that would in time be replaced by the straight magazine. The other Thompson has this later magazine, but is quite a poor sculpt. The only other weapon is the pistol holstered on the officer’s belt, although the crew of the medium machine gun might also have had them but do not. No one carries a bayonet, but then if no one is carrying a rifle then this would make sense. The sculpting is pretty good, with good detail and realistic faces and hands. The various weapons have been quite well done, although naturally those weapons moulded from above and below (the Boys and the PIAT) have little detail on the sides. Proportions are fine, and nothing here feels too chunky or exaggerated, so these mix well with infantry from other manufacturers. Flash is minimal, and the only extra plastic is between the arms of the Vickers gunner and the man feeding the mortar – compromises which we felt worked well here. The large pouches of the ’37 webbing were very useful for many things, but we would have liked to see more specialist kit for those carrying the Brens like the spare barrel bags. Nevertheless we found much in this set to admire and only some tiny points of concern. Some of these weapons have been done before, but many of the poses are new, and we felt this good set easily justified its existence and would be a worthwhile addition to any scene depicting this famous army in action.